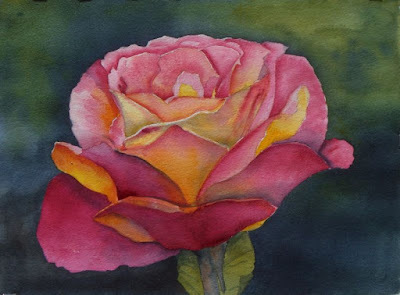 I painted this rose from a photo that I took at the Missouri Botanical Garden a few years ago. I've never really attempted to paint any florals formally, so this I guess is my first try. I thought this rose might afford me some opportunities to practice my unifying and separating wash technique that I learned in Laurie Humble's workshop. This was a challenging painting, and I have mixed feelings about the results; I feel like I succeeded in a couple of areas but the exercise quickly revealed that I also have a lot of room for improvement and learning in other areas. I did two paintings of the same subject; the first one appears above. On the second, I tried to get a little looser, rely on building up layers/glazes, and go lighter on the values. The second attempt appears below. I'm really not sure which one I like better; they both have pros/cons to them. I guess the thing I came away with is that I've got a lot to learn, and I learned a lot already by attempting this challenging subject. I've got other stuff to look at on Flickr.